Kevin MacDonald (THE EAGLE) returns to the documentary format with this insightful, beautifully edited documentary about Bob Marley. MacDonald inherited this "troubled" project after Scorsese and Demme left, apparently during the editing process, but it's clear that MacDonald was able to go back and shoot extra footage because his voice is occasionally heard interviewing Marley's family and friends. As a result, this is a project very much in the style of TOUCHING THE VOID. MacDonald comes to the material with a clear, curious head, but stays in the background - letting Marley's contemporaries (to whom he has exceptionally good access) speak for themselves. MacDonald does not flinch from emotionally and politically tough issues - Marley's multiple girlfriends - the difficulty his children had in breaking through the entourage to his get to their father - Marley's political naivete - often playing for the "people" but hijacked by nasty political factions, and African dictators. The documentary begins at Nine Mile - up in the verdant hills of Jamaica - far away from the cliched image of Montego Bay. Marley grew up in rural poverty, doubly cursed by being of illegitimate and mixed race parentage. An outsider, he becomes fiercely competitive (even with his own children), strongly disciplined about his music, his route to escape. He followed his mother to Trenchtown, the Kingston ghetto, and made his early forays into the music business with the Wailing Wailers - a kind of Motown clean-cut boy band influenced by local ska and mento music. After a brief excursion to the US, following his mother, frustrated at his lack of success, he returns to Jamaica and his musical style and philosophical self-confidence seems to turn on his becoming a Rastafari. 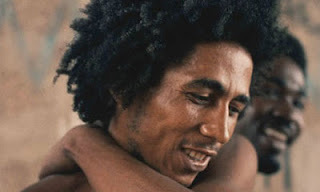 The documentary spends a good amount of time examining what this religion meant to Marley, and why an outsider might have felt drawn to a minority "cult", itself the subject of prejudice, which preached "one love". But for me, the movie really became compelling when it got to its final hour, and Marley's final years. When Marley was such a potent icon that he was being used by politicians. When Jamaican politics descended into gang violence between crypto-Communists and crypto-Fascists. When Marley ships equipment to Zimbabwe at his own expense to celebrate independence, but sees his audience tear-gassed. I love that MacDonald manages to open out from a music documentary into a sad documentary about the tragedy of independence - so many former colonies descending into political chaos or tyranny. That for me, is what makes this documentary, and Marley's life and early death, tragic. (So much so that I wasn't the only person crying in the cinema.) This clash between his harsh experiences; his idealism; and the contested politics against which he had to operate. Even the images of Marley over the final credits are problematic. Is his music an evangelical rallying cry that has touched people across the world, even today? Or has he become another icon exploited by the merchandising men, like Che Guevara - a face on a T-shirt? MARLEY played Berlin and SXSW 2012. It is currently on release in the UK, USA and Ireland. It opens in Belgium on May 9th, in the Netherlands on May 10th, in Germany on May 17th, in Portugal on May 24th and in France on June 13th. MARLEY has a runtime of 144 minutes and is rated PG-13 in the USA and 15 in the UK.